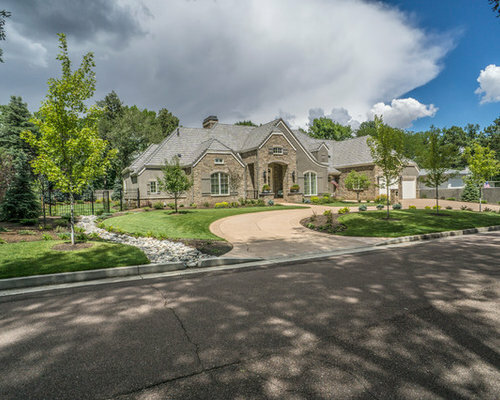 This large and lush landscape is located in the heart of the Broadmoor. 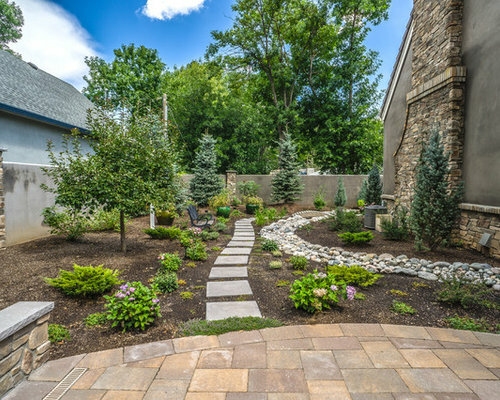 Its large paver patio, custom water feature, and beautiful garden paths really make this traditional landscape stand out among the crowd. This landscape incorporates a large circular drive that utilizes colored concrete to complement the landscape beautifully. 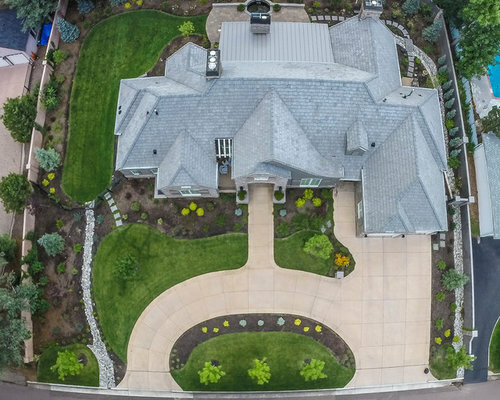 This aerial view showcases the entire landscape. The use of curves throughout the landscape give transitions a pleasant flow. This garden path is constructed of concrete stepping stones. 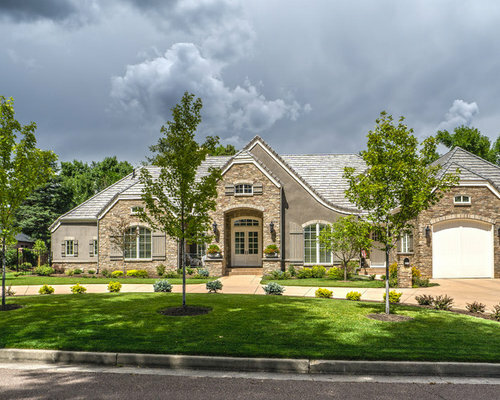 It is retained by a manufactured stone block that complements the homes stone veneer. 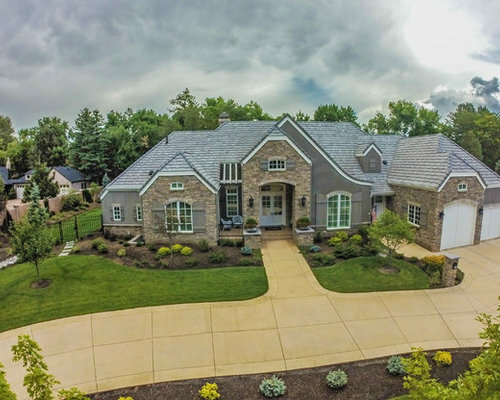 The stucco wall and wrought iron gate provide a formal entrance. By selecting a variety of shrubs and perennials, this landscape has a spectrum of different colors and layers year round. 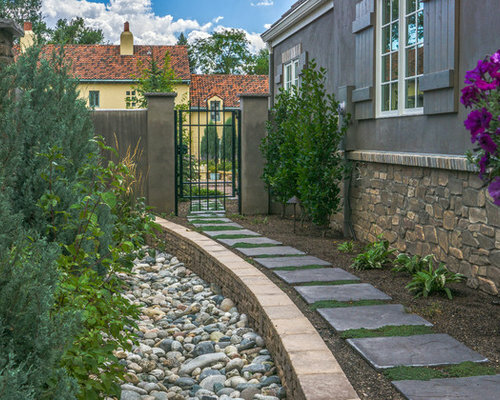 Using cobble to create dry creek beds is an attractive and effective drainage solution. 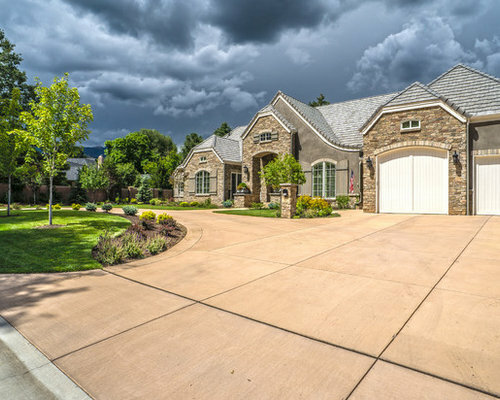 Large driveways do not need to ruin the look of a landscape. By choosing complementary colors, and utilizing similar shapes and curves, you and incorporate a large circular drive gracefully. For a perfect looking lawn, what's below the surface is just as important as what's above it. 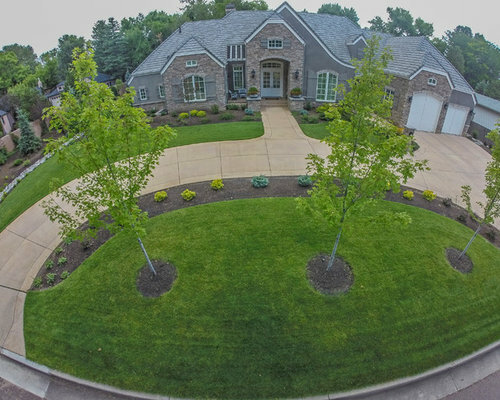 An expertly designed sprinkler system is the reason this yard looks so lush and green. 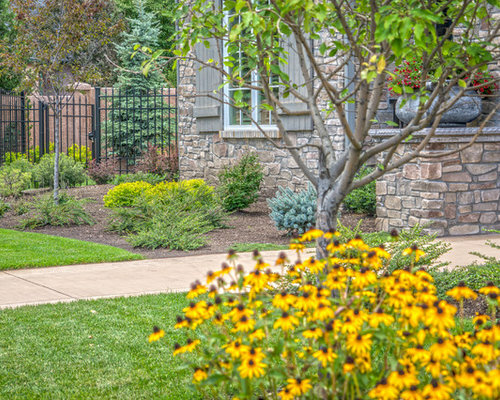 A wide walk with a variety of colors makes for a very welcoming entry into the home. This meandering garden path works its way through a densely planted gardening bed. This custom water feature is integrated into a large paver patio. It serves as a stunning focal point and creates a soothing environment. 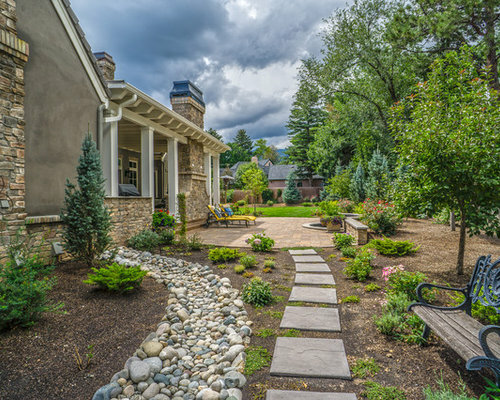 The front yard utilizes many different elements, including colored concrete turf, trees, colorful plantings, and evergreens, and water features, tied together to create a unique and interesting landscape. Choosing the right combination of shrubs will give planting beds a variety of layers, textures, and colors. Street trees are a beautiful addition to any landscape. These autumn blaze maple look great in the spring and summer, and provide brilliant fall color. This picturesque patio is the perfect place for entertaining. 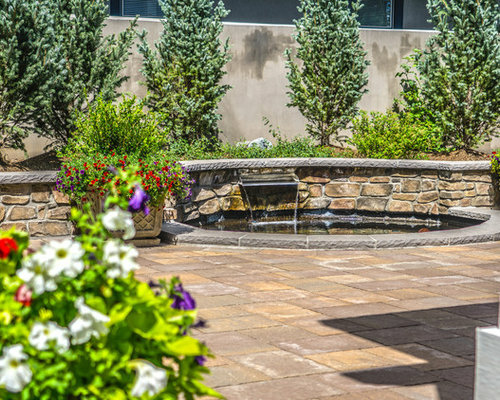 The paver patio is beautiful, and creates ample space, while the water feature creates a wonderful atmosphere. 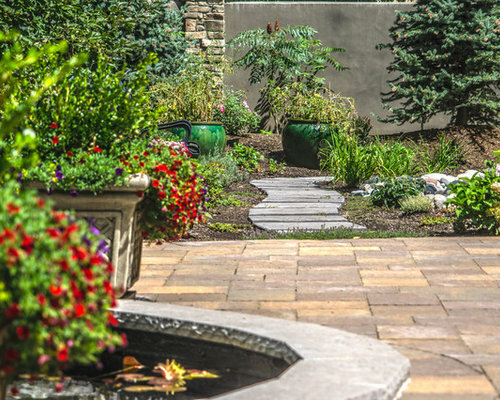 Concrete stepping stones meander their way thought a private, densely planted garden area. 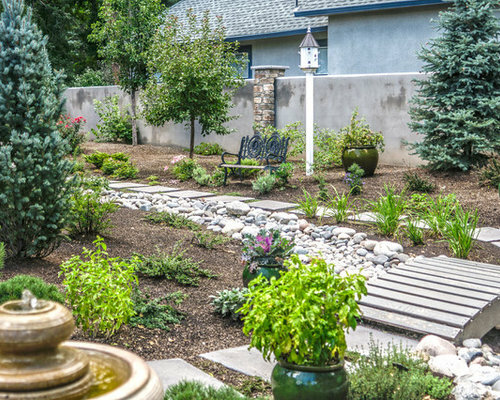 Accents like a wooden bridge over the dry creek bed, a seating bench, and container planting bring this area to life. 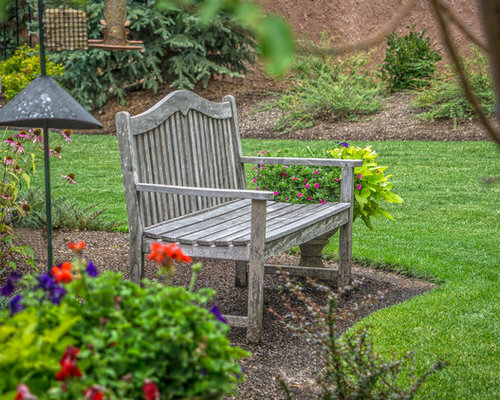 Incorporating multiple seating areas throughout a landscape can be a simple as placing a bench, and provide both a focal point and new area to enjoy your yard.